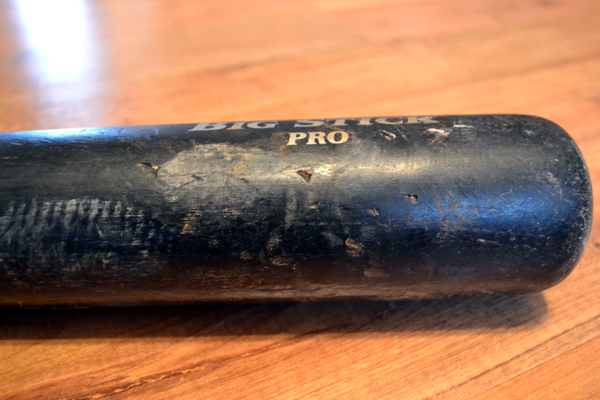 – A Curtis Thigpen clubhouse nameplate — OK, not “game-used,” but you know what I mean. Well, as promised, I added a couple really neat items to my collection during my travels last year. 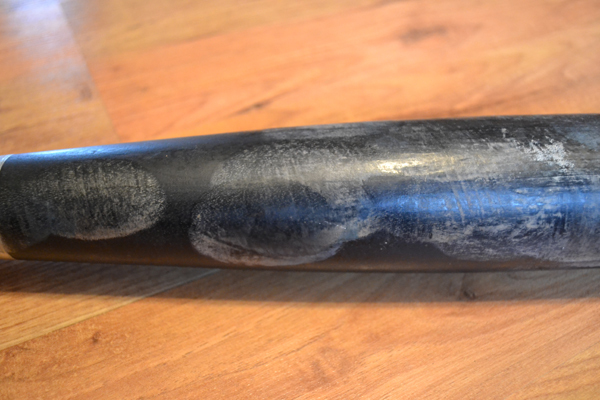 This is a game-used bat that belonged to Justin O’Conner, the Tampa Bay Rays‘ first-round draft pick in 2010. 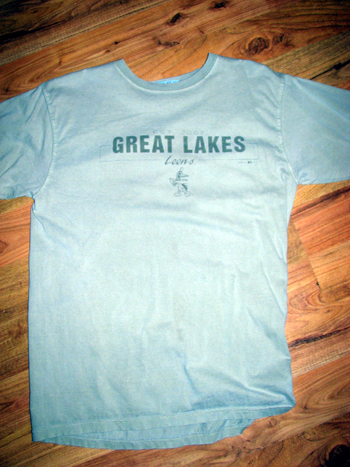 I bought it in May when I visited Bowling Green Ballpark, home of the Bowling Green Hot Rods. (You can read about this visit here.) 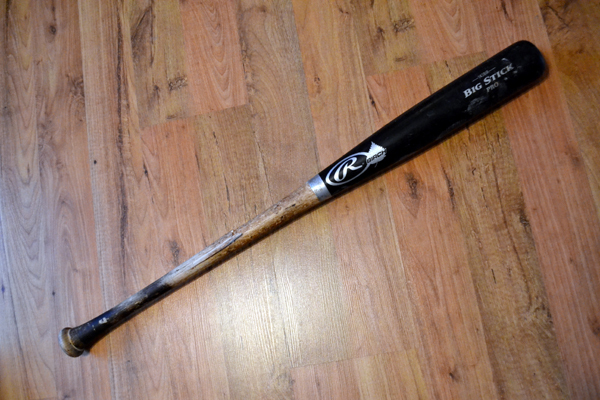 It’s exciting to have a bat from a first rounder. 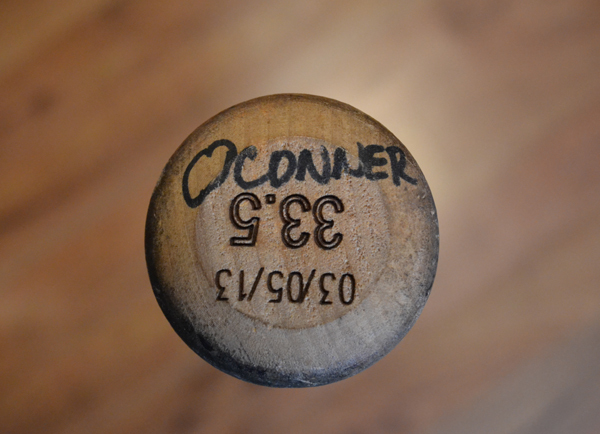 I actually saw O’Conner play back in 2012 at the Futures at Fenway game at Fenway Park, and managed to get his autograph on a ball. 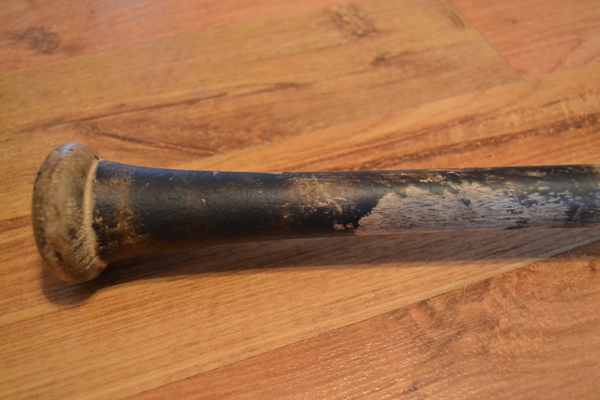 Last year, when I saw his bat in the team shop at Bowling Green Ballpark, I couldn’t resist grabbing it. 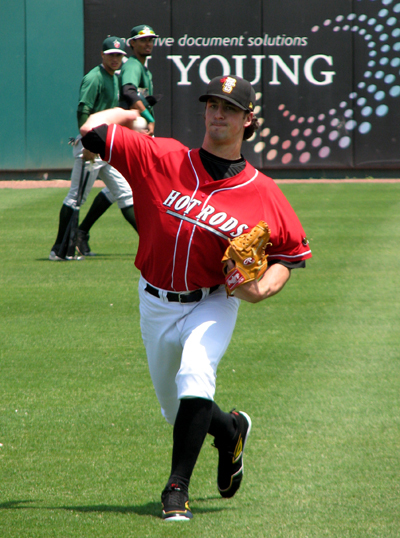 O’Conner hit .223 for the Hot Rods in 2013 but showed some solid pop with 14 home runs in 102 games. I’ll be excited to see where he starts the 2014 season and look forward to following his career. When I visited Whitaker Bank Ballpark, home of the Legends, in May, I was excited to see a TON of game-used jerseys for sale at decent prices. 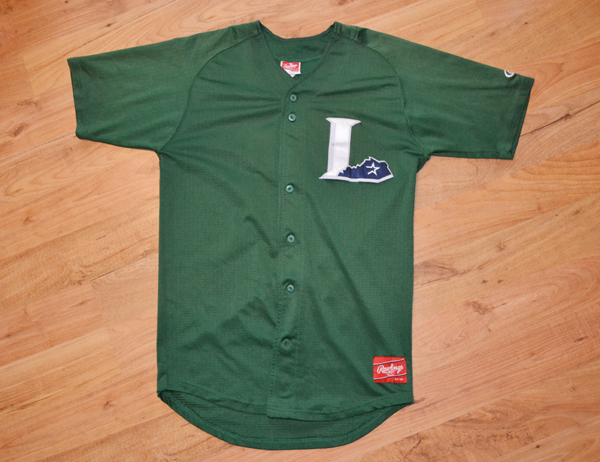 Often, you see Minor League Baseball game-used jerseys for around $100, which seems like a little much. 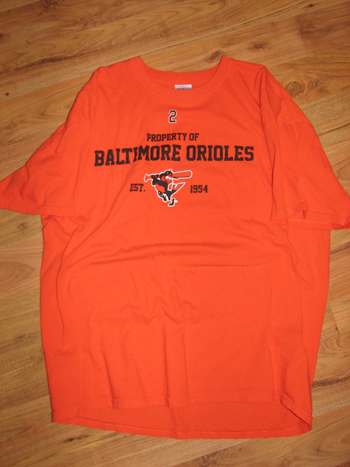 Anyway, the BP jerseys were just $25, which was impossible to resist. 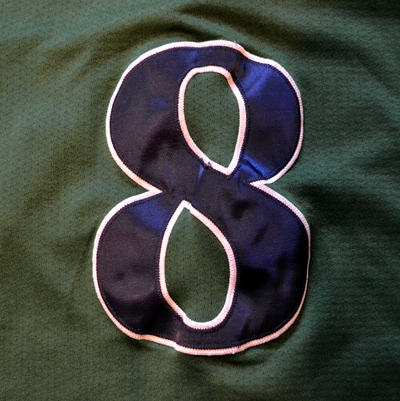 I browsed through the available jerseys, worn during the 2012 season, while checking out the team’s 2012 roster on The Baseball Cube. 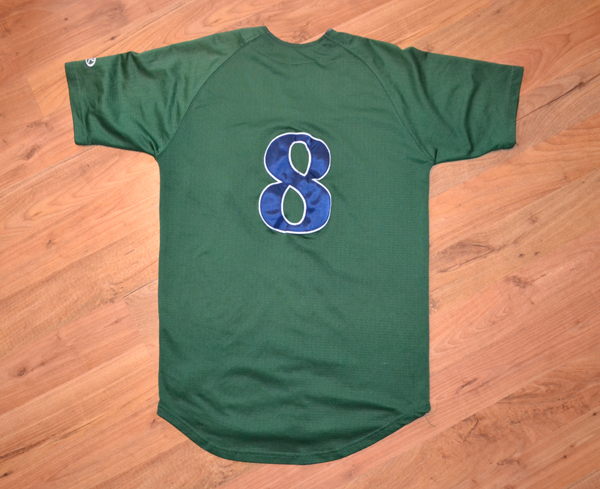 My goal was to find a jersey of a player with promise, and when I came across the #8 jersey, I saw it apparently belonged to first baseman Zach Johnson. 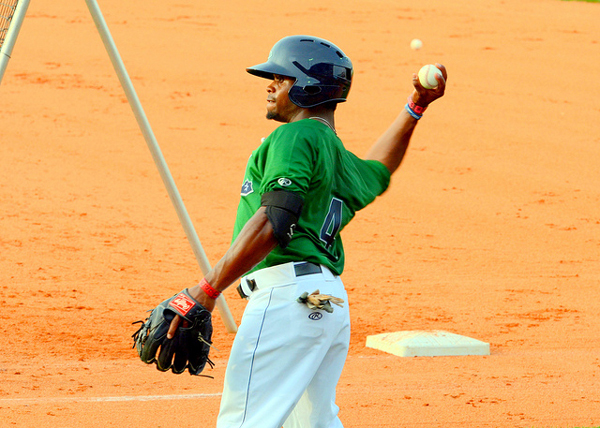 While with Lexington in 2012, Johnson hit 15 home runs and added 108 RBIs. I was sold, and grabbed the jersey off the rack. 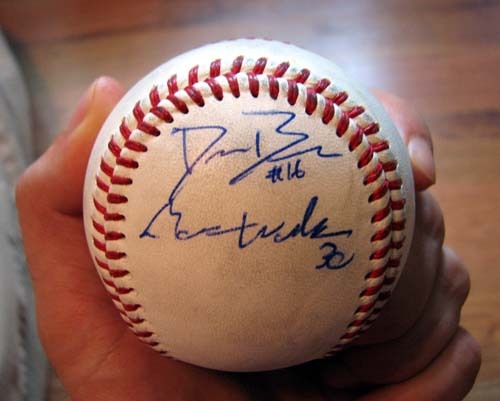 When I took it to the counter, the staff member said, “Nice — Delino DeShields, Jr.” Huh? I told him I was pretty sure this was Johnson’s jersey, pointing to the data on my iPod. He replied that he thought DeShields might have worn the #8 on a promotional jersey night when his usual #4 wasn’t available in his size. If that was the case, what number did Johnson wear on that night? Or did Johnson play? As I said, it’s a mystery. Now, back to the mystery. I’ve found proof that Johnson wore my jersey in 2012. The next four pictures I found online, and were taken by Clinton Riddle. 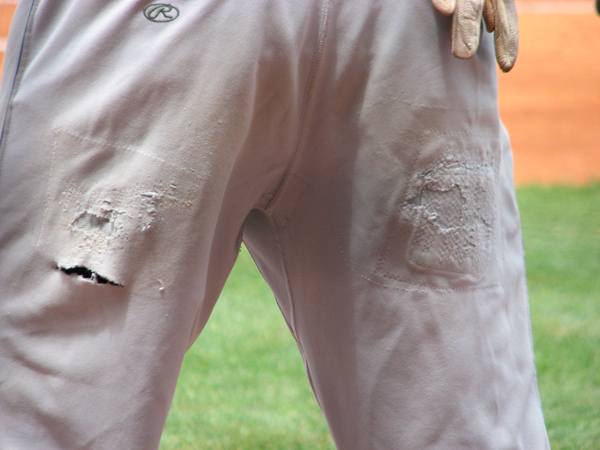 As you can tell from these photos, they’re taken during BP, not during a game. So, based on what The Baseball Cube says, and with the photographic proof I can find online, I’m sure the jersey is Johnson’s. 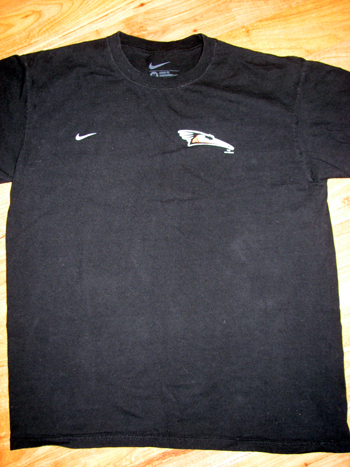 But I’m curious about the suggestion of the team shop employee, and I’m determined to find out the truth. I’m going to contact the Legends, as well as DeShields, Jr., himself, to get to the bottom of this mystery. And when I have an answer, I’ll share it here! 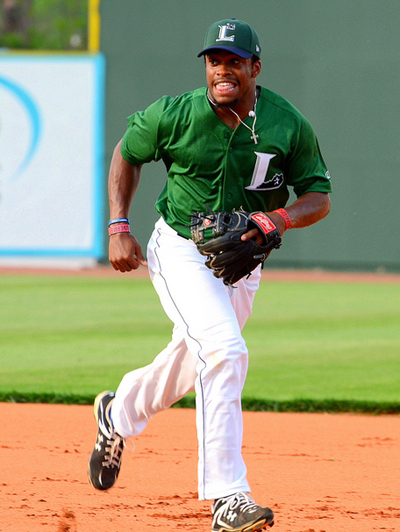 I suppose there’s still a chance DeShields wore the jersey once, but that’s probably difficult to confirm. 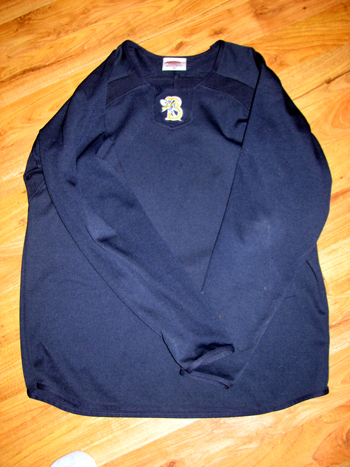 In any case, the theory about the rightful owner of the BP jersey sure made for a fun mystery while it lasted. As always, thanks for reading. 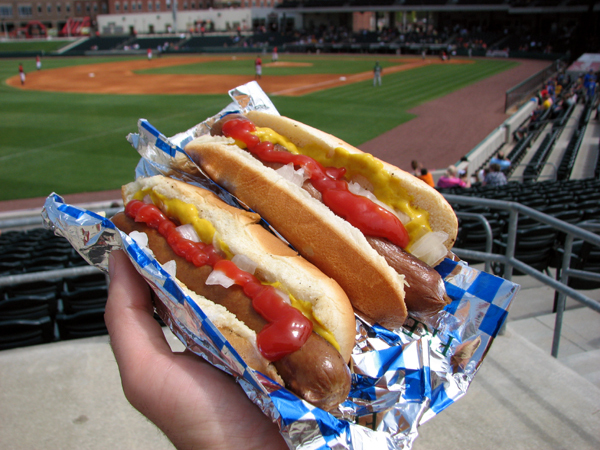 Please visit The Ballpark Guide for comprehensive fan guides to MLB and MiLB parks and remember, each of your visits help support my road trips! I’m on a Professional Baseball Jersey! 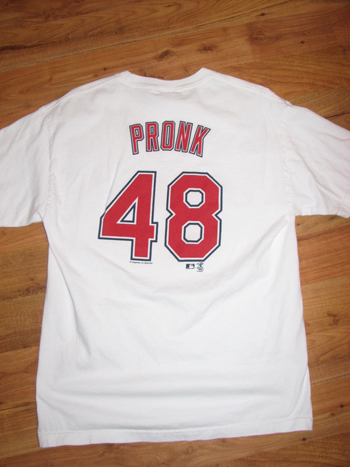 When I was a kid, I dreamed that one day, my name would be on a professional baseball jersey. It took a while, but it’s finally happened! OK, so it’s not exactly what I dreamed about. But I’m still pretty excited. 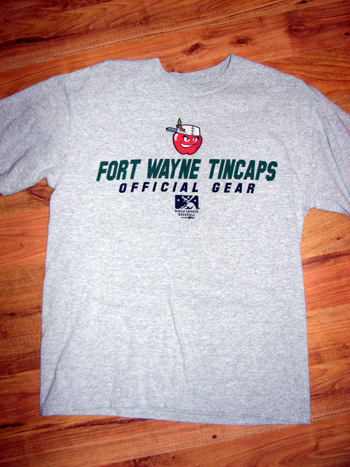 This spring, I read that the Fort Wayne TinCaps would be wearing a special social media jersey for a game in June. 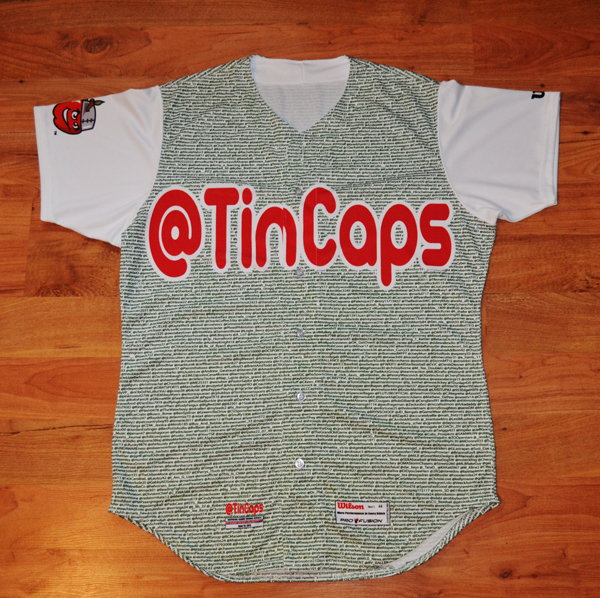 Promo jerseys are nothing new in the minor leagues, but this one made me take notice — it would feature the Twitter handles of all 6,000-odd of the team’s followers. Awesome, right? 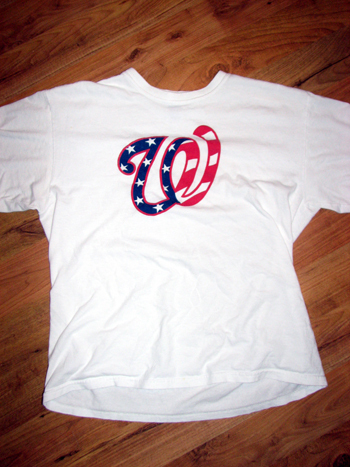 I started following the ‘Caps on Twitter early in 2011, before I visited Parkview Field in May of that year. 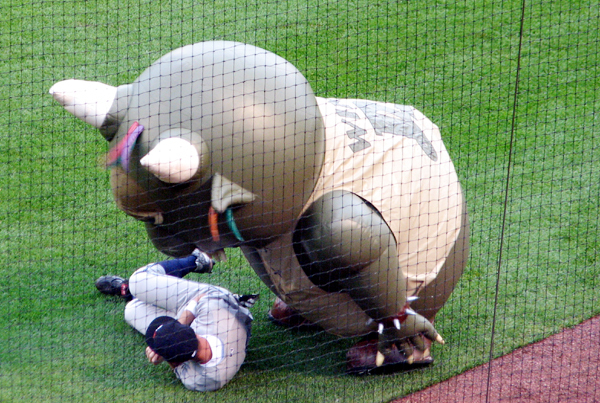 That visit still ranks as one of my favorite ballpark experiences, and you can read all about it here. 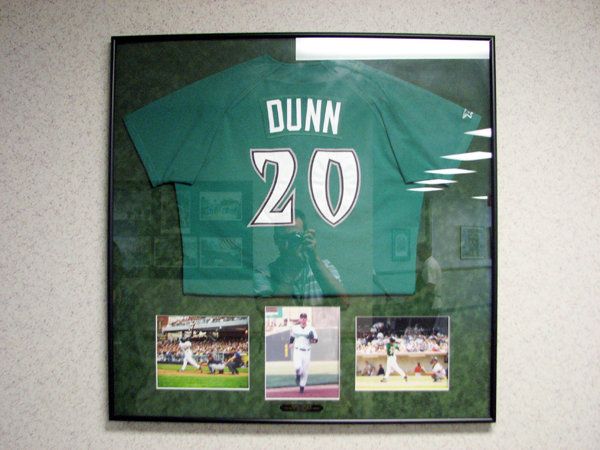 The highlight, though, was this: During the game, TinCaps general manager Mike Nutter introduced himself and gave me a lengthy tour of the ballpark, including a stop in the clubhouse and tunnel next to the dugout. I’ve semi-kept in touch with Mike via Twitter since then, and I sent him an excited tweet upon hearing about the social media jersey. He responded right away, assuring me I’d be on the jersey, and that was all I needed to hear. 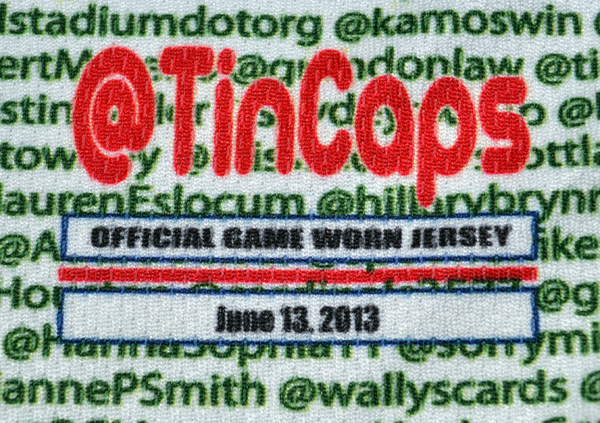 See how the team’s name is “@TinCaps,” rather than just “TinCaps?” Super cool. 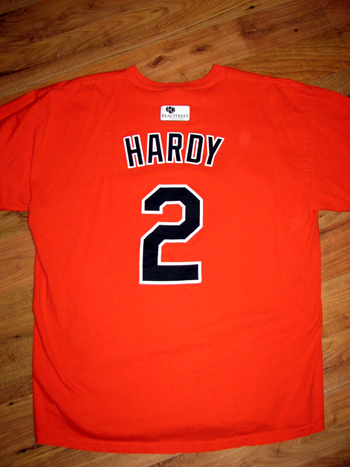 Once I’d marveled at the look of the jersey, the lengthy process of finding my Twitter name began. I was also keeping an eye out for Craig Wieczorkiewicz’s Twitter name. You hopefully know Craig as the Midwest League Traveler, and he and I have been excitedly exchanging tweets about this jersey for a couple months. I spent the afternoon searching for both names at regular intervals. I’d stop when I was a little cross-eyed and resume a short time later. I’m still busy scouring the jersey for Craig’s name and am having fun noticing the other MiLB clubs and people I’ve met on Twitter. And that brings me to my next point: Is your Twitter name is on the jersey? Would you like to know where it’s located and get a picture of it? I’m happy to help. All I’m asking in return is to support my baseball road trips by making a small donation to The Ballpark Guide, and then I’ll track down your name and get in touch with you. 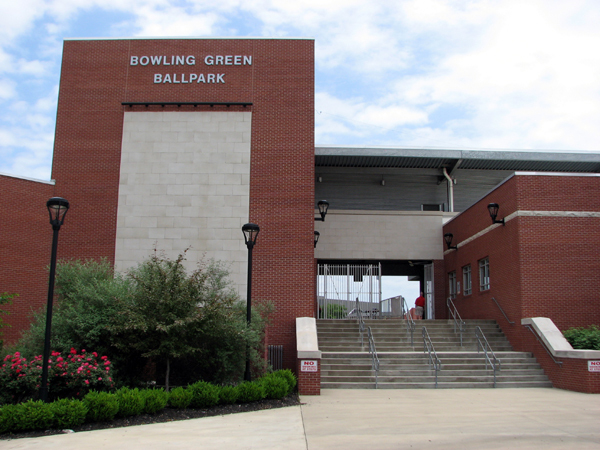 – The Midwest League’s Bowling Green Hot Rods were hosting the Fort Wayne TinCaps at 2 p.m.
– I wanted to get to Bowling Green Ballpark before noon. 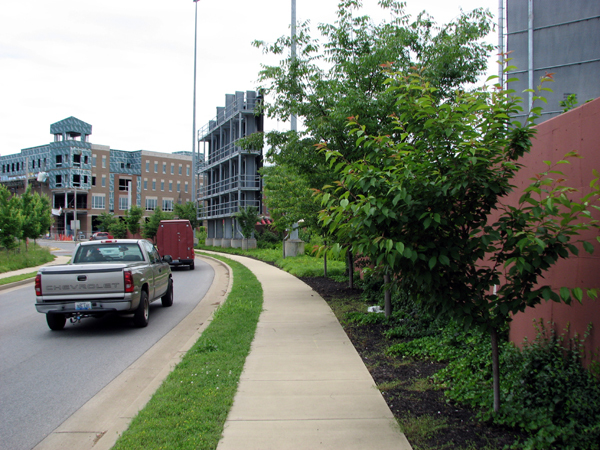 – The drive from Cincy to Bowling Green is nearly 3.5 hours and I had a couple stops to make. All this meant that despite more than a week of traveling and a lack of sleep, I was up bright and early on a Sunday morning to hit the road in good time. 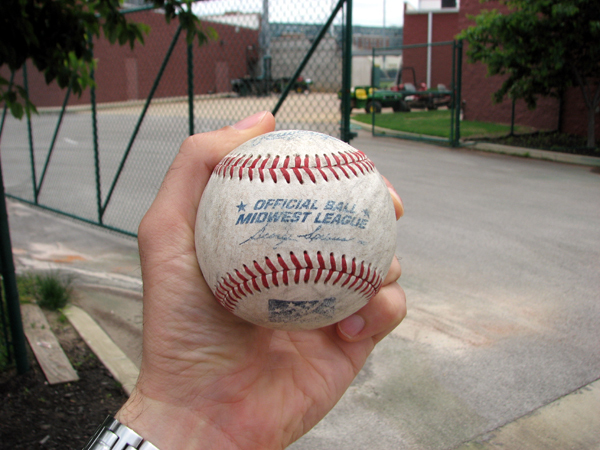 Batting practice was taking place, and despite being a good chunk more than 500 feet from home plate, a nicely worn Midwest League baseball was sitting in plain view. I was initially puzzled by its location, but didn’t take long to realize what’d happened. 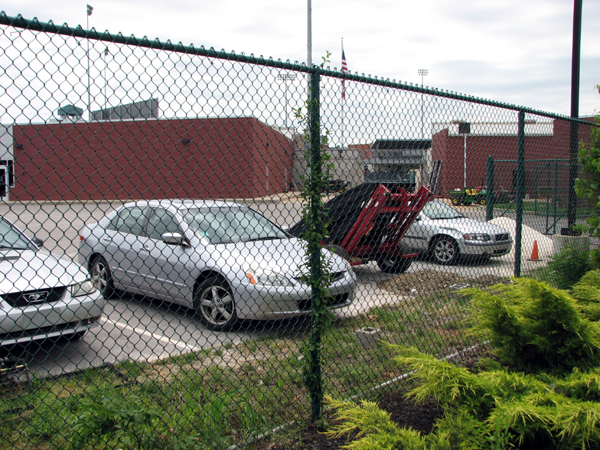 You can see a tiny green sliver of the field above the tractor with the two yellow seats, which means the outfield fence gate was open. 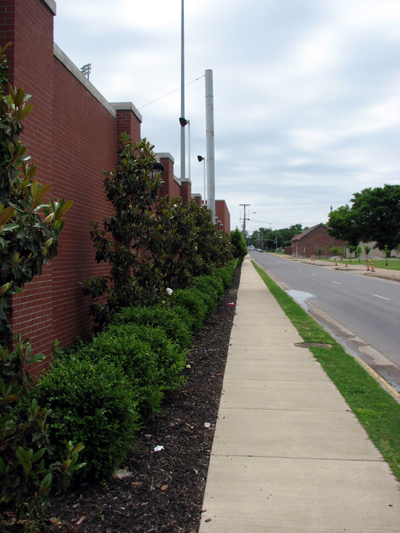 The ball must have rolled through the gate, hit the edge of the chain-link gate to the left of the photo and followed along the bottom of the gate until ending up on the sidewalk. I had no idea how long the ball had sat there, but was happy to add it to my collection. Sure enough, that’s me in the red/orange shirt. There was a short delay on the video board, hence the image not showing me taking a photo. I’d grabbed this seat for a couple reasons. 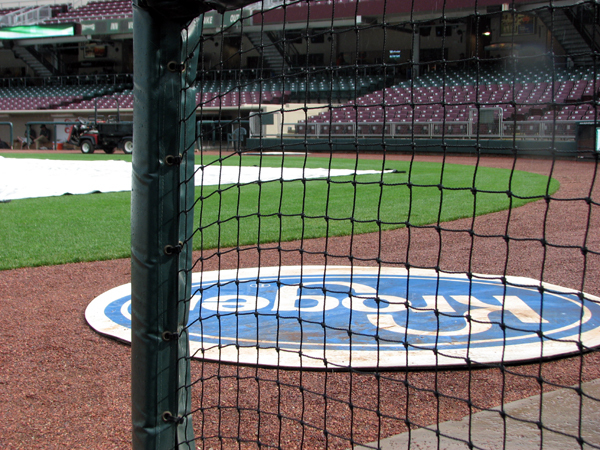 One, it’s tough to argue with sitting in the first row behind home plate. 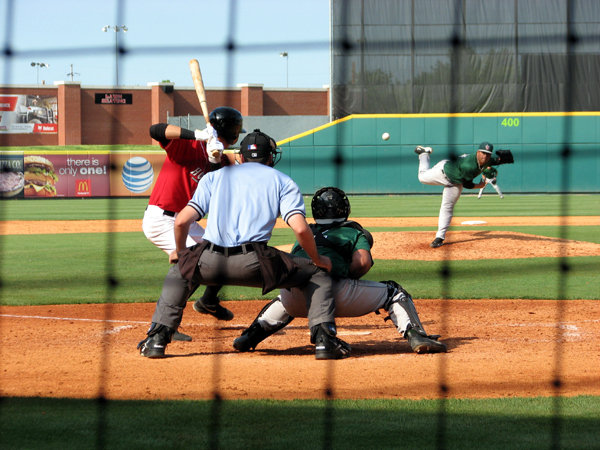 And two, I wanted to get some head-on action shots of Guerrieri and Ross throwing. I should say an extra thanks to Hank and the Hot Rods, who provided me with a media voucher that paid for my lunch. Up here, I experienced a first for me. I’ve never seen the protective netting behind home plate reach all the way up to the second deck, but if you look carefully at the above photo, that’s exactly the case here. Hmmm. Where to look? Well, I got busy and started parting the clumps of greenery as quickly as I could, hoping to spot the clean, white sphere. It was stifling hot, especially after my long-distance run, but braving the heat and occasional pricks from branches, I soldiered on until I spotted a ball. Success? Nope. This ball had clearly been half-buried in the mud for days, if not weeks, and to loosely paraphrase Star Wars, it was not the ball I was looking for. I looked for a few more minutes and abandoned the dream of finding the ball to return to Tissenbaum before making the long trek back inside the ballpark. 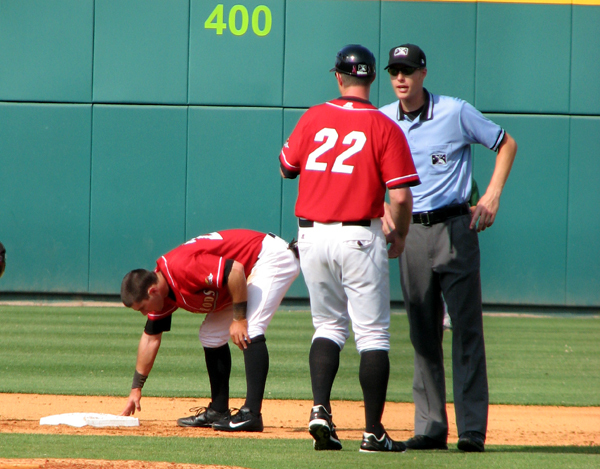 The Caps scored three runs in the first off Guerrieri and after Bowling Green came back to take a lead in the seventh, went ahead for good on the home run ball that I couldn’t find. Final score: Fort Wayne 6, Bowling Green 5. Although I was looking forward to relaxing in my room for the evening, I planned to make the very short drive to Outback for dinner. 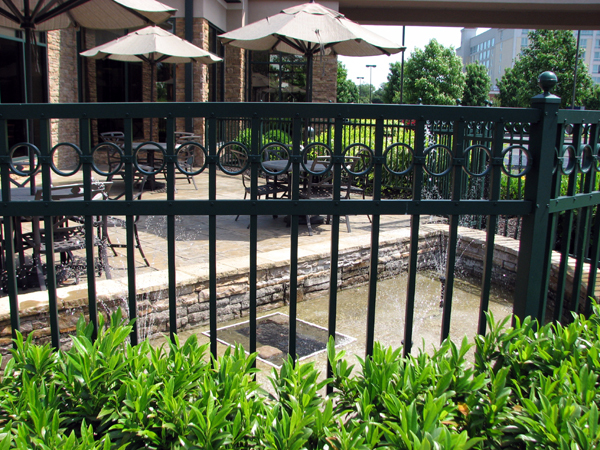 I always try to have one Outback dinner on each of my trips, and there was an Outback just a few minutes away from the hotel. 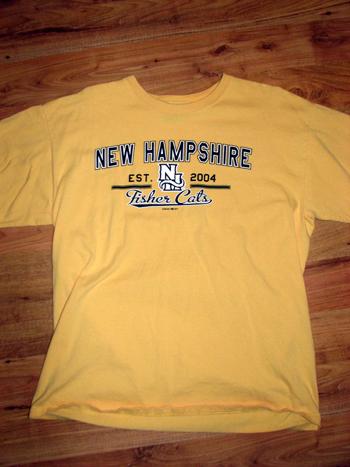 And speaking of other things in the area, well, there are almost too many to list. 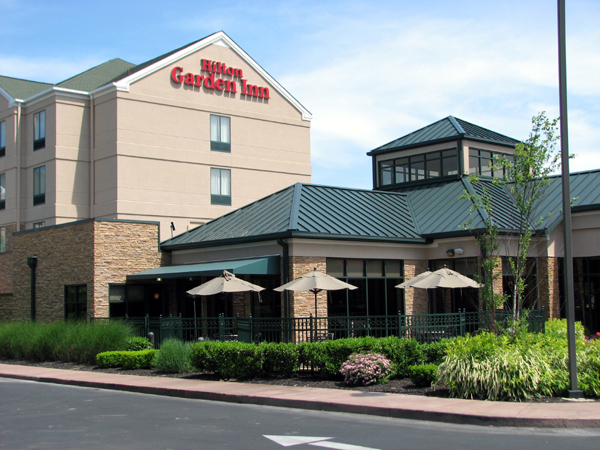 The hotel is virtually walking distance to such eateries as Buffalo Wild Wings, Steak ‘n Shake and Double Dogs, a fun-looking hot dog-themed restaurant and bar. It’s also virtually next to the airport if you happen to be flying into town and a golf course if you enjoy sneaking a round of golf into your baseball road trips. All told, it was a great hotel and it’s definitely the spot I recommend picking when you visit Bowling Green for some Hot Rods baseball. … and then zipped over to Outback for a huge, tasty dinner before returning to the Hilton Garden Inn and watching Sunday Night Baseball. A perfect end to a perfect day. 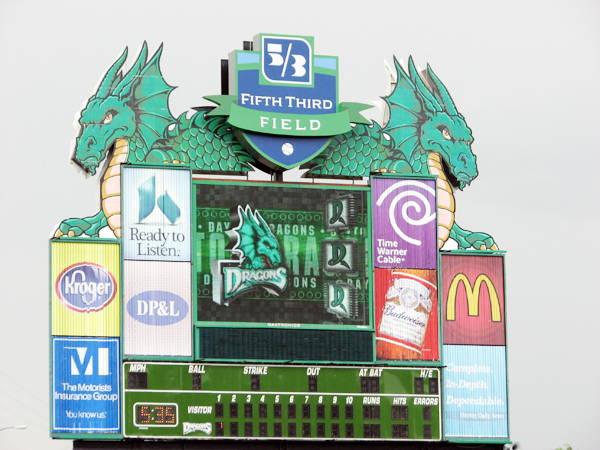 It’s been a couple years since my last foray into Midwest League territory, but with my May 22 visit to Dayton to see the Dragons, I was back. 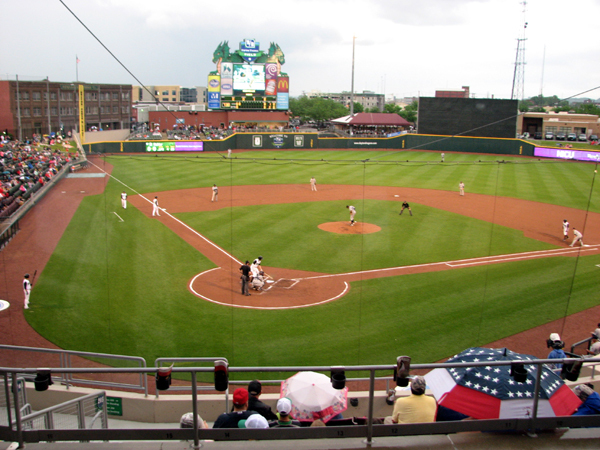 I visited five Midwest League ballparks in 2011 — Fort Wayne, Great Lakes, Lake County, Lansing and West Michigan, for those keeping score — but was pumped to see Dayton, which Sports Illustrated has called “one of the 10 hottest tickets in sports.” More on that later. The drive from Columbus to Dayton isn’t far, and if you’re in either city, it’s worth seeing if the team in the other city is playing. 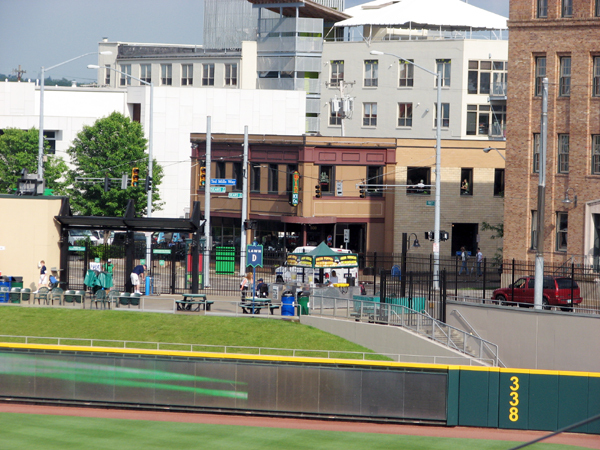 I noted that Columbus’ Huntington Park is a great place to watch a game, and from the moment I pulled up to Dayton’s Fifth Third Field, I could tell the same was true here. Unfortunately, Mother Nature wasn’t too happy on this day. 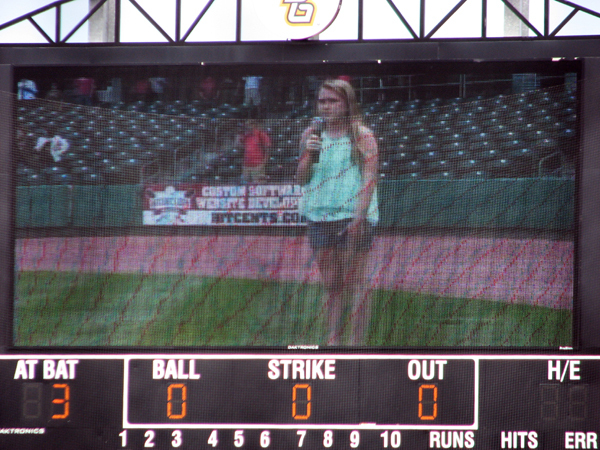 I’d experienced great weather each day of my trip, but when I got to Fifth Third Field, the rain started to fall. I parked across the street and ran to the suite entrance. By the time I got inside, the quick downpour had all but stopped. Although I’m always excited to check out a new ballpark, this visit was extra special. 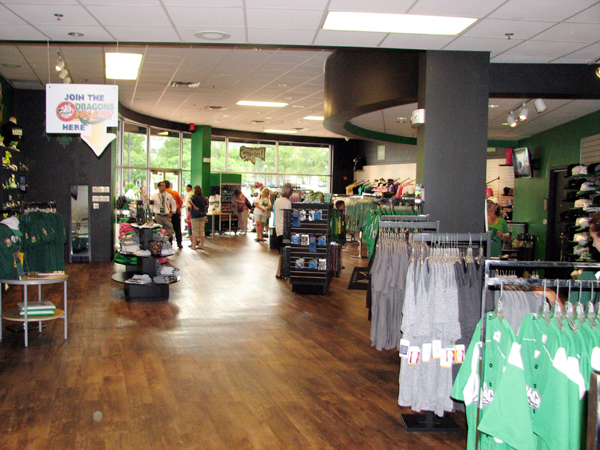 I was lucky to get a tour from Brandy Guinaugh, the team’s director of sponsor services. She met me in the lobby at 5:15 p.m. and for the next hour, took time out of her busy day to show me the ins and outs of Fifth Third Field, including many stops behind the scenes. 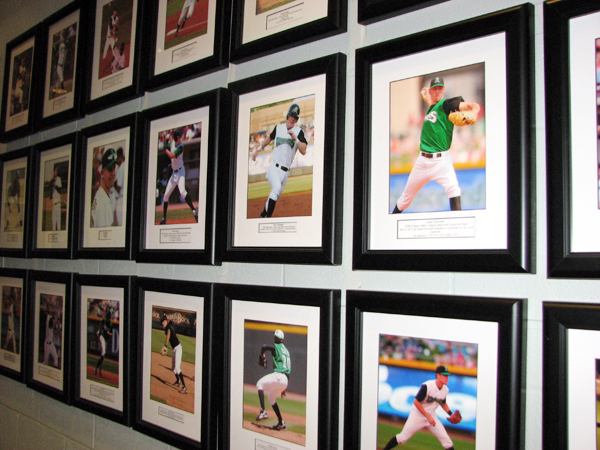 Across the hall from the alumni wall is another display honoring celebrities who’ve appeared at Fifth Third Field, often to throw out the first pitch. 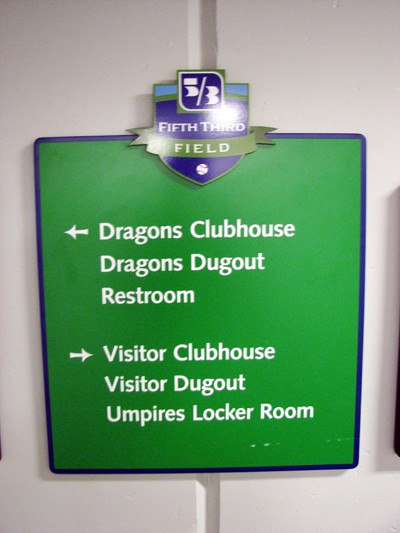 One notable guy I saw was Johnny Bench (the Dragons are an affiliate of the Reds), and it was neat to see him, given I’d seen him just a few days earlier at the Field of Dreams game. 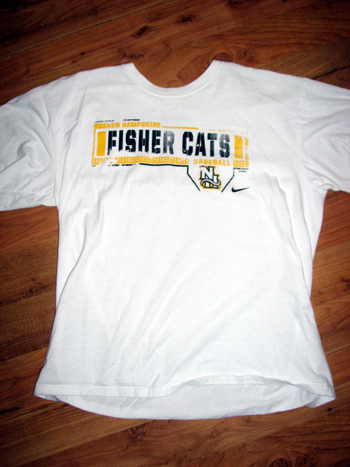 Two other ex-athletes were notable — Magic Johnson and Archie Griffin, each of whom owns a stake in the team. The team’s principle owner is Mandalay Sports Entertainment, whose name you might recognize. 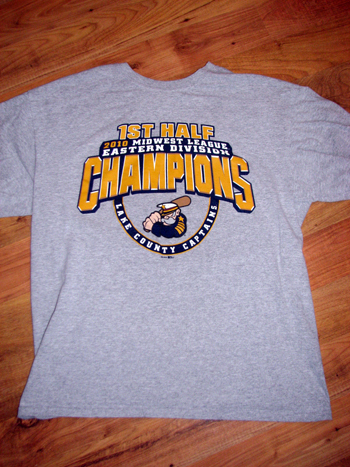 The sports division of the enormous entertainment company also owns the Erie SeaWolves, Frisco RoughRiders, Oklahoma City RedHawks and Scranton/Wilkes-Barre RailRiders. 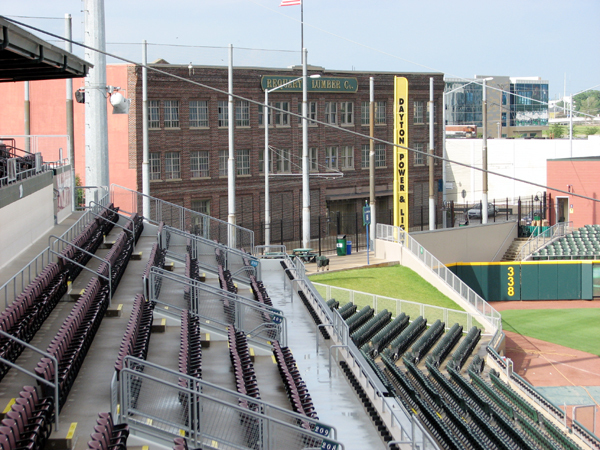 See this building beyond left field? And this one beyond right? Brandy pointed them both out because Adam Dunn and Votto have each hit the buildings with home runs. 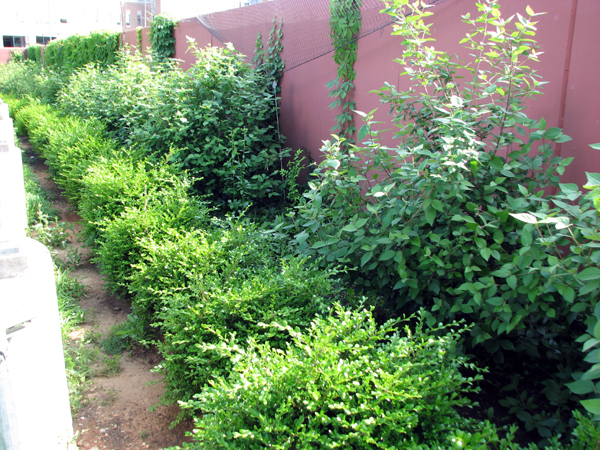 Look how far they are beyond the wall! Our next stop was a big highlight — we went into the official scorer’s booth and spoke to the man who has the best job in the ballpark. He’s the guy who presses the button to activate the scoreboard dragons, and he asked me if I wanted to press the “most important button in the park.” My answer? I pressed away and watched the two sets of eyes glow red and steam cut through the air. Super cool — I’ve never done anything that’s affected a video board in my travels. Our last visit was the enormous team shop on the concourse level, and after all the time Brandy had spent with me, she had to get back to her pre-game duties. Thanks for the tour and your time, Brandy! Him: I’ll wait to take your money until you see the salad. 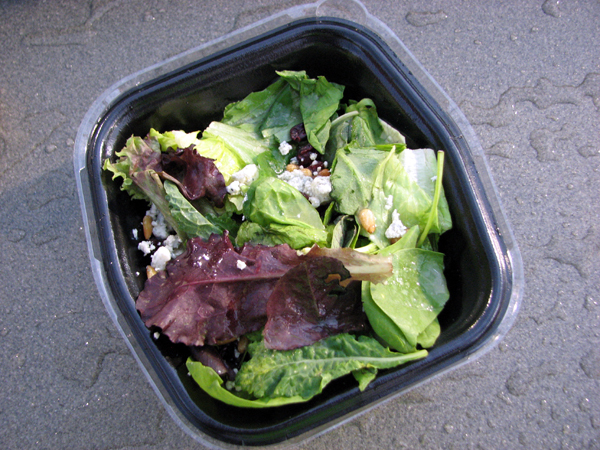 I was pleasantly surprised and while this exact salad might not be on the menu when you visit Dayton, give the healthy choices some consideration. Despite the threat of rain, the game went off without a hitch and I was glad to get another Midwest League city under my belt. 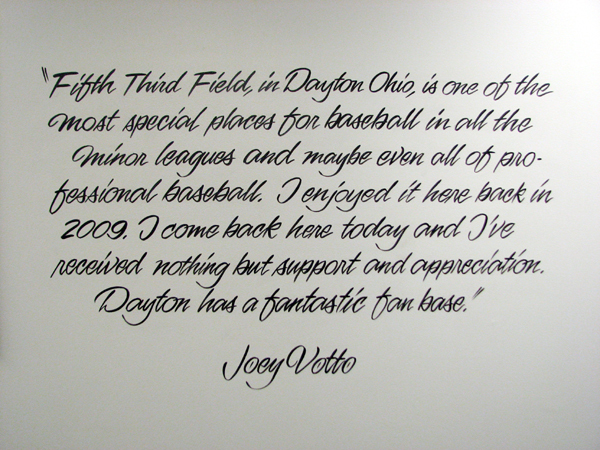 Fifth Third Field is an awesome place to catch a game and definitely worth visit — as long as you can get a ticket. I’ve said before that there’s nothing like the first ballpark visit of the season, and while that’s true, I’m always extra pumped for my first extended road trip of the year. Already in 2013, I’ve been able to hit four games — a doubleheader at Syracuse’s NBT Bank Stadium and a pair of Blue Jays games at Rogers Centre. If you click this link, you can see a list of everywhere I’ve been and also bring up my blog entry about each visit. Those trips were the appetizer to the main course that is my May road trip, which begins on Friday. I’ve taken road trips in May for the last couple years. In 2011, I visited nine parks in 11 days and in 2012, I went on a grueling seven-park, four-day trip. The schedule I’ve come up with for this year will be my longest road trip to date but one that is sure to be awesome. 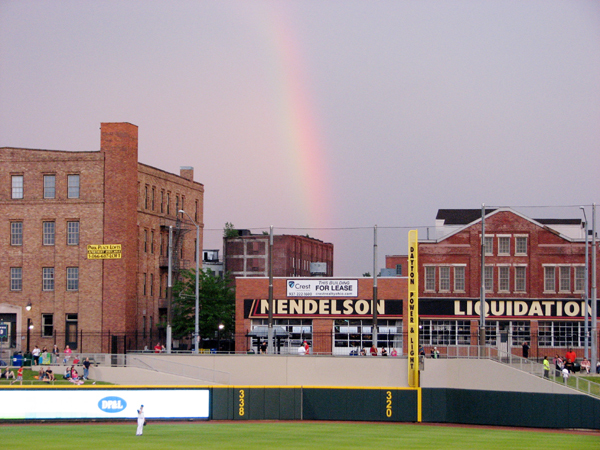 Rochester’s Frontier Field is the first ballpark I visited after starting The Ballpark Guide in 2010, and while the park has sentimental value to me, it’s also one of my favorite places to watch a game. Geographically, it’s a logical starting point for this trip, and I can’t resist stopping there again. As you’ll see, I’ll end up spending a couple days in Rochester and will be lucky to attend the Pepsi Max Field of Dreams game. This will be a once-in-a-lifetime opportunity to see a number of MLB legends up close. Some of the game’s all-time greats, including Johnny Bench, Wade Boggs, Rickey Henderson, Trevor Hoffman, Reggie Jackson, Pedro Martinez, Mike Schmidt and Ozzie Smith will be playing. As excited as I am to see those guys, I’m most excited to see Fred McGriff, who was my first favorite ballplayer back when he played for Toronto in the ’80s. I’ve been to Cleveland’s Progressive Field three times since 2010, and consider it one of my favorite places to visit. 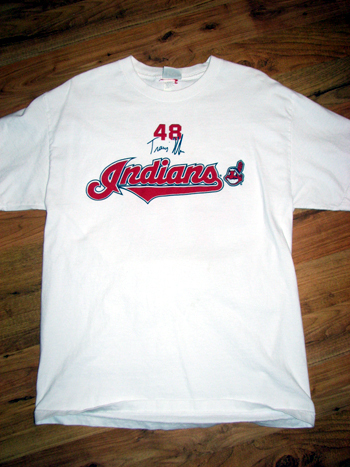 But, as you’ll see later in this post, this won’t be my only chance to see the Indians at home. 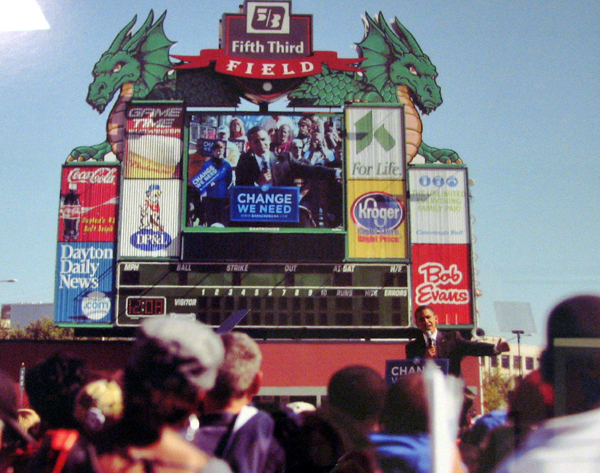 I’ve seen Bowie play at home and Akron play on the road, but haven’t yet visited Akron’s Canal Park. 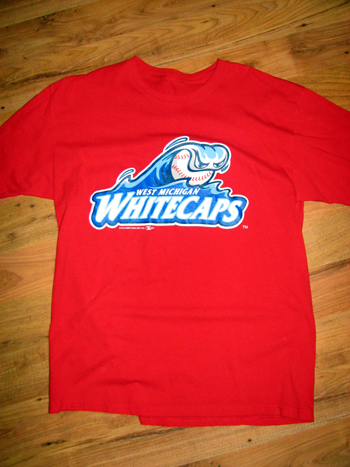 I don’t know much about the home of the Aeros, but do know about one notable concession item. The Three Dog Night is a hot dog stuffed in a bratwurst stuffed in a kielbasa, all loaded on a bun with sauerkraut and mustard. I guess I know what I’ll be having for dinner. My visit to Columbus’ Huntington Park will be for a 10:35 a.m. game, which means May 21 will be an early morning. 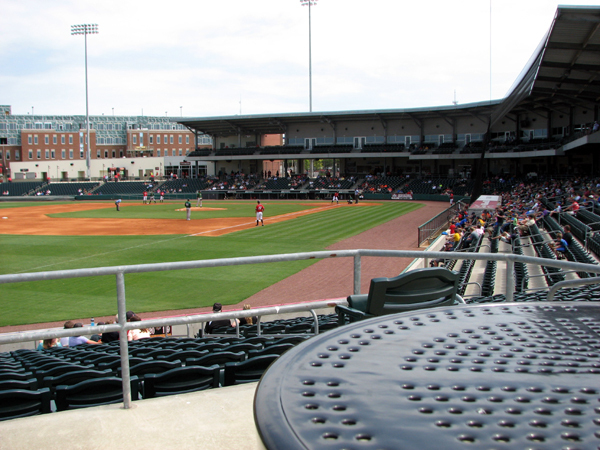 More importantly, Columbus will be the eighth International League team I’ll have seen play at home. Louisville promises to be an exciting stop on my road trip. 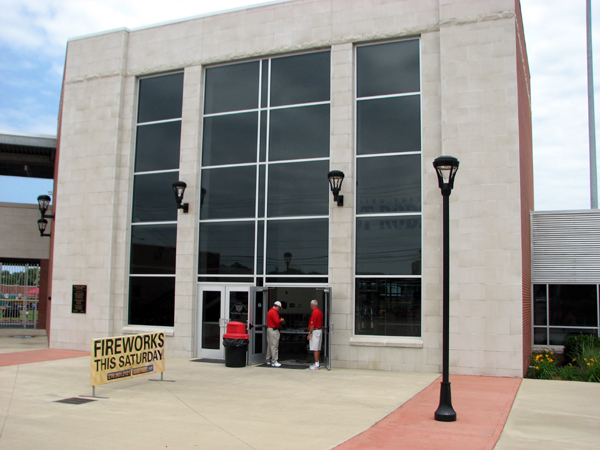 In addition to seeing the Bats play at Louisville Slugger Field, I also plan to visit the Louisville Slugger Museum and, as a huge boxing fan, the Muhammad Ali Center. Whenever I’m visiting a new MLB park, I like to catch two games, if possible. I’ll spend my second Reds game checking out whatever I missed the day earlier, and I’m excited to get an MLB Network backpack, which is the giveaway of the day. Visiting Fort Wayne’s Parkview Field is one of the best ballpark experiences I’ve had so far, but this time, I’ll be seeing the TinCaps on the road in another Midwest League showdown. 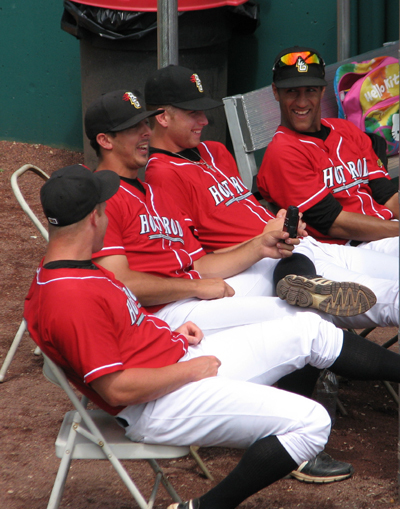 The Hot Rods are managed by Jared Sandberg, who playfully heckled my photo-taking exploits last summer. 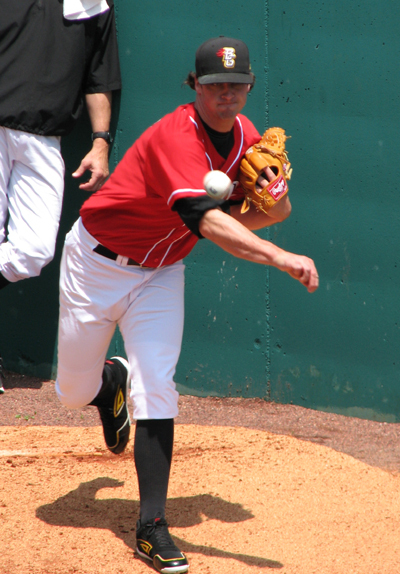 The team also includes big-time prospect Taylor Guerrieri, who I saw pitch last year at Fenway Park. The Legends were a focal point of Katya Cengel’s book Bluegrass Baseball, which I read over the winter. 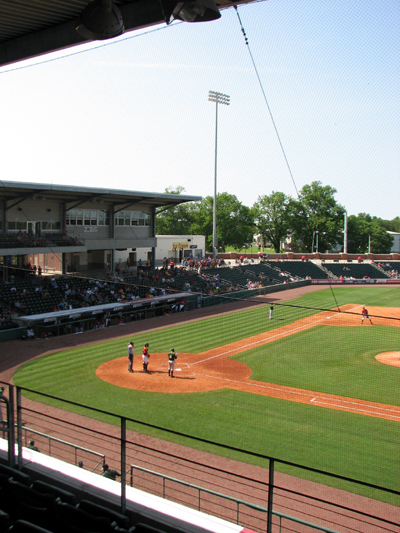 Her chapters on the South Atlantic League franchise painted a picture of the club and the ballpark, and I’m excited to check both out in person. Lexington will be the fourth SAL city I’ve visited since 2011. And speaking of the South Atlantic League, I’ll visit Charleston, WV, to watch the Power host Greensboro on the penultimate day of my road trip. 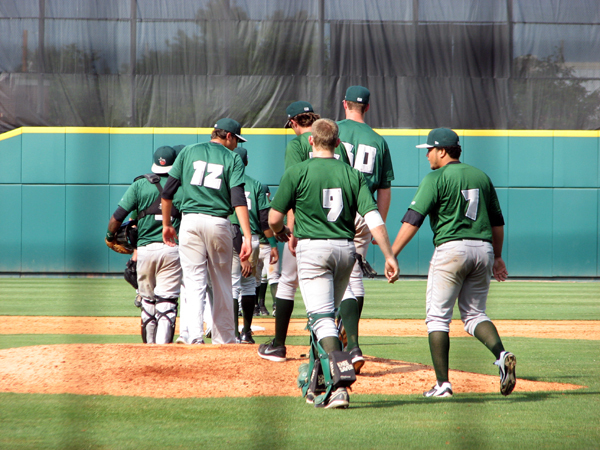 I’ve seen Greensboro once before (back in June of 2011 in a very memorable game) but have never seen the Power. 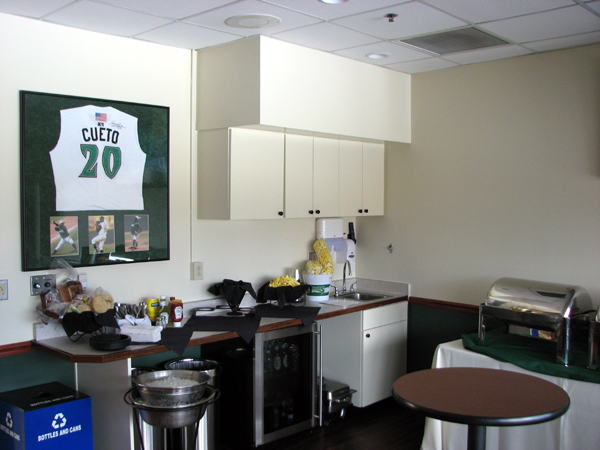 I like the look of the team’s concession menu and the park looks great, too. Why am I making a second stop in Cleveland on this trip? Two words: Social Suite. 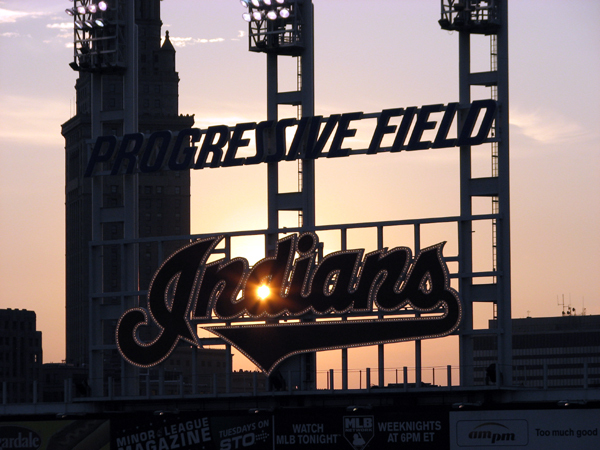 The Indians have invited me to watch their May 29 game from the Social Suite, which is a Wi-Fi-equipped suite in which a handful of baseball fans and social networking types use social media to share their experiences. I’m absolutely pumped (and honored) to be checking out Progressive Field from this vantage point and will have more details as they become available. It should be a real highlight and I’m considering live blogging the day to share the entire adventure with you. Anyone else watched a game from the Social Suite? I’d love to hear your recollections. … I’ll have seen 13 games in 10 parks in 13 days. This means that by the end of the road trip, I’ll have seen 75 games at 49 parks since starting The Ballpark Guide in 2010. Wow! I’ll be tweeting through the trip and blogging as close to daily as I can manage. 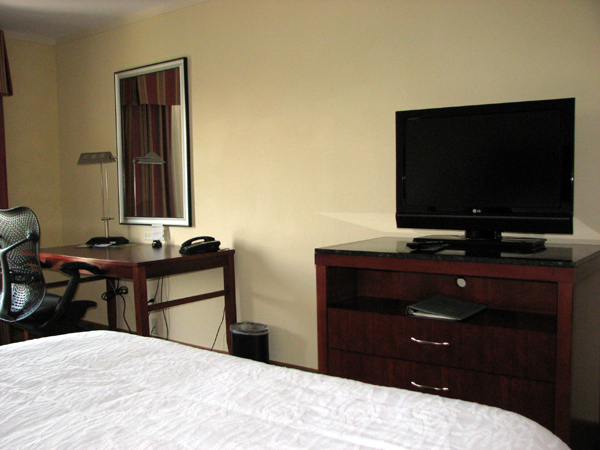 I’ll be staying in some neat hotels and checking out some cool tourist attractions, too. To keep on top of my travels, please follow me on Twitter. And if you enjoy following my adventures or have used The Ballpark Guide to improve your baseball road trip experiences, please consider making a small donation to support my trips. Otherwise, I really appreciate your hits on my website and blog. 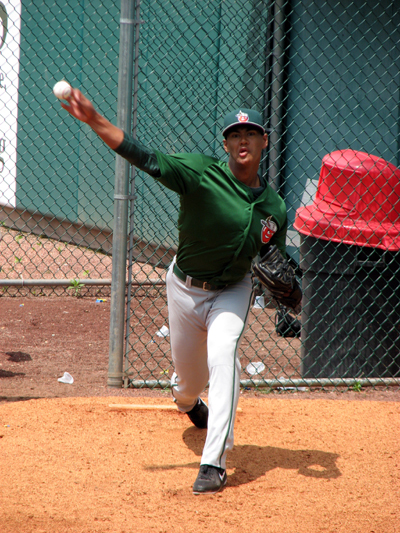 Back on May 21, I visited Cooley Law School Stadium to watch the Midwest League’s Lansing Lugnuts in action. 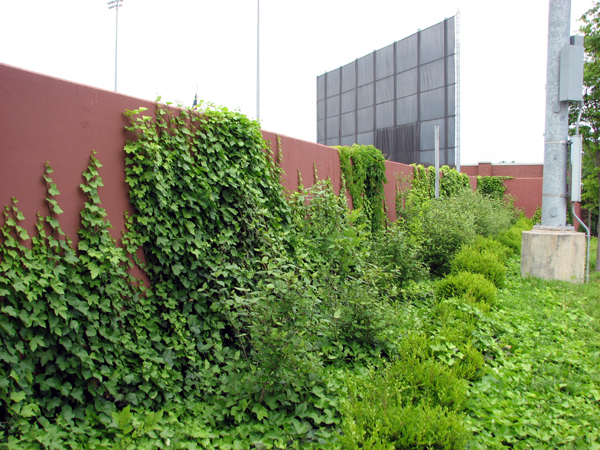 As I wrote at the time, I obtained a couple autographs at the ballpark’s autograph area in the right field corner. And who signed it, you ask? The first signature is 1989-born pitcher Danny Barnes, who was drafted by the Blue Jays in the 35th round of the 2010 First-Year Player Draft. 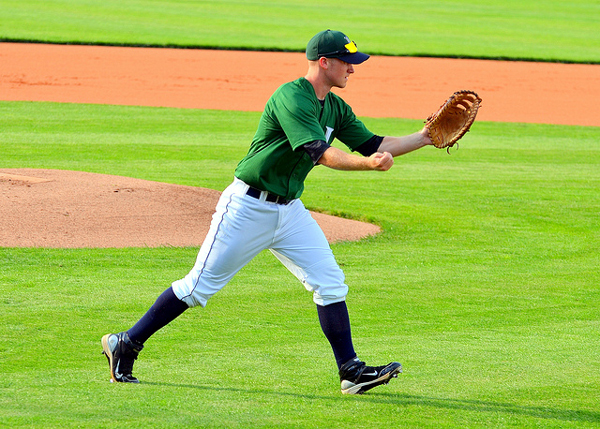 Barnes has to be one of the smartest guys in the Midwest League, too — he went to Princeton University. He’s pitching this season in a relief role, but has a very nice 4-0 record in 18 appearances. 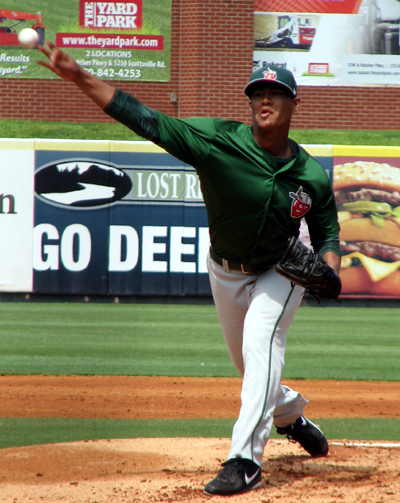 His ERA is just 2.73 and in 29.2 innings pitched, he has 50 strikeouts and just nine walks. 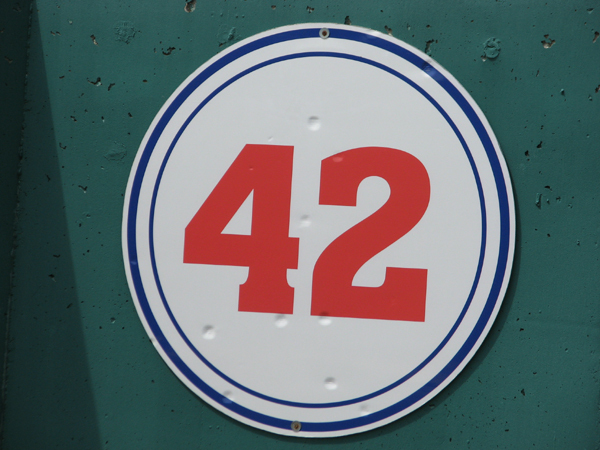 With those numbers, I think people will soon be asking for his autograph at A+ Dunedin or AA New Hampshire. The second signature is relief pitcher Marcus Walden, a 1988-born righty who’s one of three guys named Marcus on the Lugnuts. In 12 appearances this season, Walden is 1-2 with an ERA of 4.44. 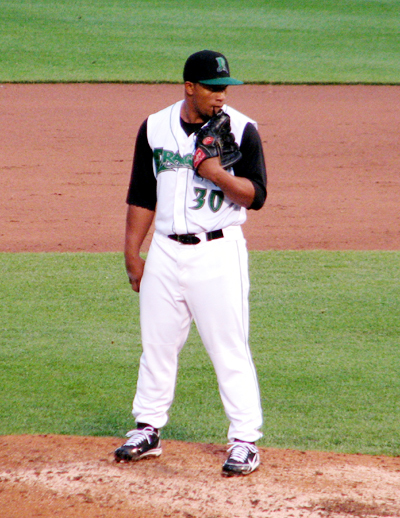 He was drafted by the Jays in the ninth round of the 2007 Amateur Entry Draft.